In 2019, Memorial Bridge is undergoing major structural repairs. So it won’t be looking like this. The Credit Union Cherry Blossom Ten Mile Run is scheduled to be run on Sunday, April 7. Its course goes around the Tidal Basin and Hains Point (on the roads, not on the walkway along the water's edge), as well as Memorial Bridge, a short section of Rock Creek Parkway, and areas of the National Mall. If you're planning to visit the cherry blossoms that morning you'll need to work around it. 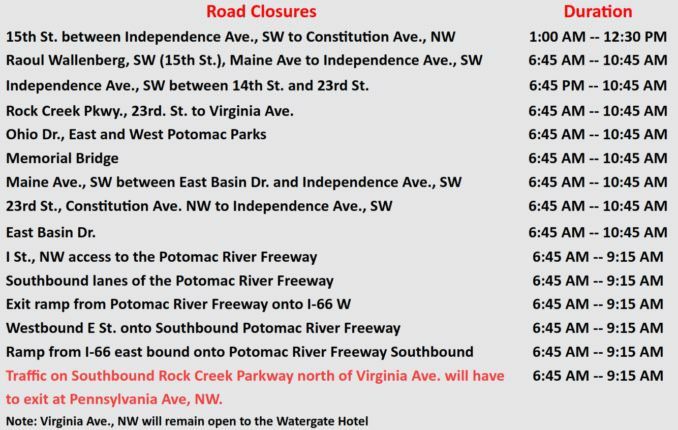 The Tidal Basin will still be open and accessible on the morning of the race, but road closures will create complications for visitors trying to get there, especially those planning to drive and park. By far the best bet will be to Metro, walk, or ride. If you arrive while runners are still running you'll have to find a way to cross the road safely without disrupting the stream of runners. It consistently draws over 20,000 runners, so it's quite a big race. The start is staggered in waves, and it can take a while for a gap to appear so that you can safely cross the road without tripping up runners. But please be sure to cross safely and sensibly--the runners are tired, focused on other things, and may not have an unobstructed view because of the crowds. No-one wants an injury from a crash, runners or spectators. But while you wait for the stream to thin out, feel free to get into the spirit of the race. Having run it several times myself, I can say that the cheering really is appreciated. If you're running the race and looking for info on picking up race packets or results, you can find it here. In the meantime, here's a taste of what's in store with some photos from previous years. I have a page with parking information here. It doesn't apply to during the 10-miler--there are other road closures then--but if you're going April 9, that won't be an issue. Thanks so much for all the info! It has been so helpful in planning our trip! Hope to be there tomorrow!